Solunar Tables® below are designed to forecast the times of day and night when fish and game are most likely to feed and be active. They are based on the locations of the sun and moon in relation to Earth. 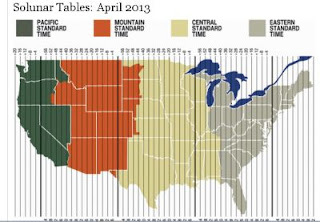 "Weather and Wildlife's Best Times to Hunt and Fish, you can enter your zip code & bring up a chart for your area.